Weekend has flown by, and it is all I have been able to do today to keep my eyes open. Didn’t even have the energy to take my “stress” to the gym, so told it to just find a quiet place to hide out of my way..
Saturday I spent working through some “issues” of the dyeing type with a very nice group who had got together to try to resolve some of the problems that had arisen since they had taken a couple of courses. On the day of their courses they had left happy with their output, but when trying to recreate at home - frustration had set in as they didn’t know quite how to resolve and take their dyeing further. My usual stance at this point is to suggest they approach individually or collectively the tutor (or in this case – tutors), as in my experience tutors are usually very happy to provide back up support, their livelihood depends on good disciples and happy people, but in this case it was not possible – for whatever reasons – which were a little unclear, but something to do with third parties being involved. So being a kindly soul, and curious as to what the problems were, I put my little grey cells into gear, and worked through with them how to methodically take what they had learned one stage further, and build confidence with replication and experimenting. When written down, perhaps not, but on the day I can only describe it sort of was grown up play time, where nothing could go wrong and if it did…well what the heck… and I learned something too !! A couple of generic issues came out though. People were asked to bring their “problems” with them, along with the dyeing recipe and methodology used, so we could collectively unpick. Aaah this proved more troublesome than I had thought. Obviously note taking had not been a major mover at either the courses or with the experimentation. I had a selection of notes proffered to me in shorthand and cypher that Samuel Pepys would have been proud of, and probably equally unable to decipher. Coffee stains, whilst proof of your industry, renders ink on paper illegible – along with dropping it in the puddle on the way out. Kettle dyeing – you either love or hate – or anything in between. Because of the ease of steaming and microwaving nowadays, it is not quite the first thing you reach for – especially during dyeing workshops. When I learned though, it was the only cheap available way of doing any dyeing. Kettle dyeing is grand for doing larger quantities of anything…not ideal for a few curls of Wensleydale. Also I am a bit fed up with only doing 100g of anything which really isn’t enough to transform into a 50” jumper (I am working on the losing of weight… honest). This was also a consistent gripe. One of the things I love about Kettle Dyeing and used in its defence is the serendipity of colour dispersion, along with the ability to dye large quantities of fleece/yarn at the same time (by the time you have zapped and stopped the microwave in 5 min bursts/100g – you might have well put on the dyepot). I very often start off with three colours from a source material, and where they bleed and mix, the totally unexpected colours take my fancy. I have been known to divide roving and use only the unintentional colours. Now this technique can be used with either natural dyeing or acid – and with the latter – being uneven and textured take-up is more often or not the desired response and logic for the use. Somehow salt though has “sneaked” into the recipes being used (either Glaubers or Table – they both seemed to be interchangeable) as well as Calgon. The ladies had not realised that Salt and Calgon “do” different things. I am not sure that I was totally clear either from a few of the courses that I have been on about that the salt issue – salt is salt, useful in an icy spell and on your chips, and the Calgon 3 seemed logically to alter the properties of the water – perhaps altering the PH and therefore colour in natural dyeing? Again – I haven’t used it consistently or scientifically enough to come to any firm conclusion, so just work on received knowledge. Prior to Saturday I did some research on the internet and the logic behind some of the recipes that I found again is not clear, so we started the day with a brain storming session – which was really interesting !!! and would be very insightful to any novelist or amateur psychologist in the guise of an artist. The consensus was kettle dyeing needed to be mastered – there are only so many socks, scarves and mittens you can reasonably wear, and uneven take up was desired to give the “individual” indi-dyer vibe, therefore a colour leveller such as salt (either Glaubers 1 or Table Salt 2) was not needed. Think through what you are trying to achieve from the dyeing session. 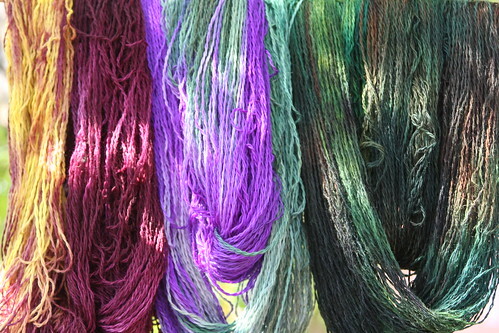 Eg: a large quantity of even-toned fibre – salt and kettle dyeing. A small quantity of clearly defined stripped yarn – microwave or steam. If you are acid dyeing, make sure you use the appropriate acid to the method (and check the quantities within the dyes if they say they are included). You may very well need salt as part of the process, or to make the colour work. I think I ought to mention here, that Salt as a generic term seems to cover a multitude of products amongst the group. Table, Sea etc., seemed to be the common ones to hand instead of bothering with ordering Glaubers (one lady used something she found in her husband’s shed – there was no label on it, and it looked a little like something Agatha Christie might use in one of her plots). To the best of my knowledge – these all are prepared using additives (except the latter which looked distinctly poisonous to me…), and will do little for the actual process – except they can alter the colour achieved. I sourced a really good article on the net which explains better than I can – link in Footnote 2. Back to the Calgon 3 - we are living in a hard water area, which often distorts natural dyes, and can to a lesser degree with acid. Calgon is a water softener, and therefore useful to neutralise the affects of hard water. If you are living in a soft water area – duh…? You are not going to look stupid to your class group if you ask a question as to WHY? Most probably two or three others in the group would wish to ask the question as well. If your tutor doesn’t know on the spot – no worries, this isn’t about “catching them out”, this is about extending your knowledge and why you signed up to the course. In my experience, you will find that either your tutor has a reason or logic and that is why they are respected and running the course, or will go away and find out for you and send you the details, or someone else in the group can answer. Either way, knowledge is good. A good tip is if you don’t want to ask a question, find the mouthiest person in the room and ask them quietly – they are usually more than happy to facilitate and be a conduit to your tutor. I know I am !! (both the mouthiest and facilitator). Now I am one of those people that less is more (apart from dye that is) in the dye pot. I have a sneaky suspicion that chemicals – added for whatever good and justifiable reasons – can react with heat and along with agitation cause felting because they break down the fibres and make the whole thing unstable. This was clearly born out with one person’s very felted roving, a shade of dung instead of translucent awe inspiring greens - unfortunately. She was adamant that she had not agitated during heating. I believed her - as recently have had the problem when altering my ingredients and methodology without really looking into the science. Lovely shade,but totally unspinnable, with the massam fibres being clearly damaged (I looked under a microscope – useful having kids sometimes !!). What we did establish though, when trying to recreate the problem was that she had used too much water, and far too much in the way of dyes and additives, and had brought the whole mix to a very rapid heat and left boiling for quite some considerable time (she tells me she cooks cabbage the same way – which I can believe…). She hadn’t needed to agitate, the poor roving was trying to escape all by itself. So LISTEN carefully to the methodology as outlined, ONLY use the ingredients with caution and don’t do anything to extremes – unless you are trying to produce felt.. I didn’t know the temperatures of simmer and boil until last week – but assumed I had… so check, check and check. Lastly – to soak or not to soak and for how long – days, weeks, months – years? Depends what you are trying to achieve. Even take up of dye, soak over night in water and with a squirt of washing up liquid. This is supposed to help wet the fibre, not wash it completely – so if it is dirty – do that first…. Short of time? – but still want even take-up - at least an hour on the day with squirt of water, and again make sure that the products used to pre-prepare fibre or suint are washed out. You are using the washing up liquid to help the fibre absorb – breaking down the natural barriers, a wetting agent. NOT TO SCOUR last year’s mud out of the fleece. Want uneven results - happy to use the suint or preparation products as a resist ?– just bung in kettle pot as is, and the wool preparation products, along with the wool itself will offer some resistance which adds to the colour way. Work out WHAT YOU WANT TO ACHIEVE, then look at how you can use the wetting process to your advantage. Does any of this help you? I hope so, even if you practically can’t see how, at least you will realise you are not alone..
and my ladies ? Well they know where to find me and that I am happy to help wherever possible..
and what did I learn..? The more I learn, the more I realise the less I know… and isn’t it fun finding out !! FootNote 2 (Taken from www.pburch.net/Dyeing - Excellent article, so would comment you to read it). Table salt is fine for dyeing, especially if it's non-iodized, but sea salt is not a good choice because of the minerals in it, as well as the unnecessary expense. Pickling salt is better because it does not have additives. What salt does, in high water ratio immersion dyeing, is reduce the tendency of the fabric to repel the dye. Since both the fabric and the dye are negatively charged they tend to repel each other. The addition of large quantities of salt reduces the electronegativity of both fiber and dye, making it easier for the dye to associate with the fiber so that it is located handy for the formation of a chemical bond. FootNote 3 – Calgon contains polycarboxylates which softens hard water.